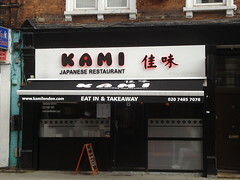 Japanese restaurant in Kentish Town. It's very small, seating only 16 people in a narrow room with a semi-open kitchen running along the side. They also do takeaway and delivery, with online ordering via Deliveroo. Kake visited on a Tuesday lunchtime in August 2014. There was one other customer in when I arrived around 12:45pm, and four when I left around 1:15pm. Music was playing, mainly the more easy-listening type of instrumental jazz; this wasn't too loud, but augmented by the sound (and smell) of frying from the kitchen. I went for the lunch sushi set B (£15), which included salad, miso soup, 7 nigiri, and 6 pieces of maki. The salad photo was crisp and fresh, with a tangy, savoury dressing; I very much enjoyed it. The miso soup was fine, though nothing special. The sushi photo included a good mix of fish — 2 salmon nigiri, 1 tuna, 1 seabass, 1 cooked prawn, 1 yellowtail, and 1 butterfish. The rice was generally quite good, with distinct grains, not mushy, and the seasoning present but not overwhelming. The fish was fine with the exception of the seabass, which had a very chewy section in the middle. The maki were inside-out salmon and avocado rolls, cut just a little too big for my taste, but the avocado was just right. When my sushi arrived, the waiter immediately poured soy sauce for me, but she used much more than I wanted, which made it difficult to get the right mix of soy sauce and wasabi. Service was fine other than that, though. A 10% service charge was auto-added to the bill photo. Kake's verdict: I might come back if I was in the area. I was particularly pleased to see a good diversity of fish in the sushi set. Accessibility: Can't remember if there was a step to get in. Access to the toilet is quite narrow and involves turns and a (tiny) step. Last visited by Kake, August 2014. Opening hours taken from menu on that visit. Last edited 2019-01-18 18:59:43 (version 2; diff). List all versions. Page last edited 2019-01-18 18:59:43 (version 2).